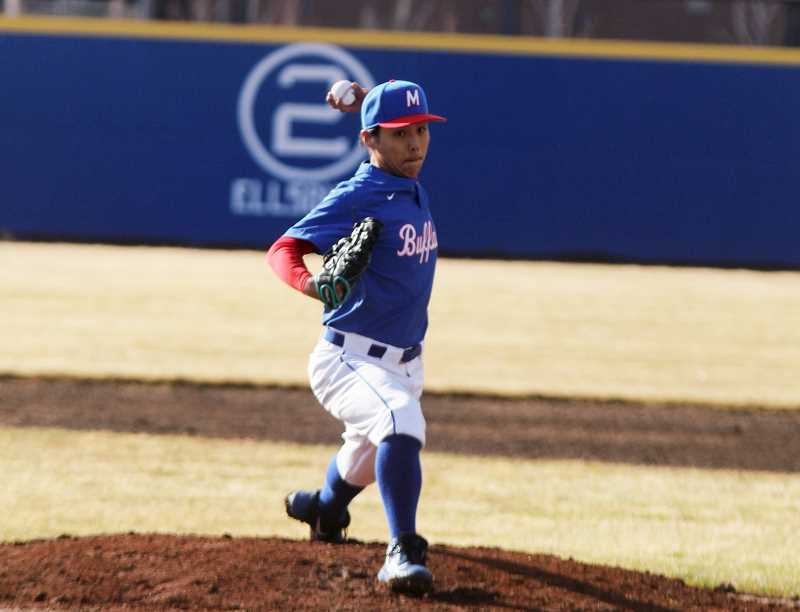 The Madras High School baseball team hosted the La Pine Hawks April 3, and lost 5-1. Madras and La Pine were both held scoreless in the first two innings. Two errors by Madras set up runners in scoring position for the Hawks, with Riley Pinckney up to bat. Pinckney hit a two-RBI single to left field in the top of the third inning. La Pine couldn't score in the fourth inning, but two singles and a walk loaded the bases for the Hawks with no outs. Pinckney hit a ball to center field, scoring another run for La Pine. Alex Farnsworth hit a pop fly out to center, but the La Pine runner tagged up at third. Bryce Cobble hit a grounder to left field for an RBI single and La Pine took a 5-0 lead at the end of the top of the fifth inning. The only other score of the game came from the Buffs in the bottom of the seventh inning. Trent Mitchell blasted a ball to center field for a double and was hit home by freshman Carter Dunten. Dunten hit a line drive to left field for the first and only White Buffalo score. La Pine ended the game with nine hits and one error, compared to the Buffs' six hits and two errors. Dunten led the Buffs in hitting, going 2-for-4 with an RBI. Carson King, Jesse McDonald, and Mitchell all went 1-for-3 batting, while Kody Zemke went 1-for-4. Reece White and Michael Belgard were the pitchers for Madras and combined for seven strikeouts through seven innings. The White Buffalos take on the North Marion Huskies at 4:30 p.m. Wednesday, April 10. They travel to North Marion on Friday, April 12.